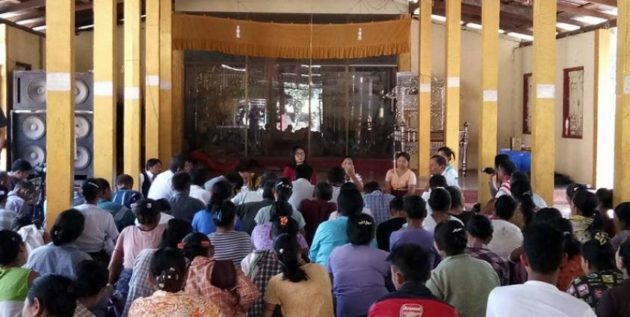 Local residents will make demands to the Union Government if the Mon State Government fails to meet their demands on Min Lwin (Maw Lay) Mountain project in Thaton Township, Mon State. “The company is working together with the government. We have submitted to the Mon State Government to resolutely stand on our side after learning about the negative consequences of the project. If it doesn’t go well, we will submit to the union government,” told Naw Ka Paw Shee, Secretary of Min Lwin Area Environmental Conservation in an interview with the Karen News on February 26. Officials from the state government departments, environmental conservation groups, and local village representatives attended a press conference concerning the project in Min Lwin Village on February 23. According to a statement issued by the press conference, an open letter has been submitted to the state government to explain the reasons why the local residents are objecting to the project. The letter explained that local residents are relying on the Min Lwin Mountain for the plants and wildlife for their survival and they will face survival issues after the cement factory is built. The cement factory project can also cause deforestation, air and water pollution, and damages to the crops of the local residents. Phyu Min Tun Company Limited has been trying to resume cement factory construction and rock quarrying project at the Min Lwin Mountain after it was suspended for nearly two years and local residents are objecting to it. Over ten villages from Min Lwin area strongly opposed the project when it was first implemented. Due to efforts made by the Min Lwin Area Environmental Conservation Committee, the Karen National Union (KNU)’s Central Economic Committee decided to suspend the cement factory project and rock quarrying at the Min Lwin Mountain on April 22, 2016. “This project will benefit the Karen residents from the villages in this area. We guarantee 24-hour electricity and water supply. We will enroll the children who couldn’t attend schools. We are going to take responsibility for the employment [of the residents] forever. We will appoint the residents from this area who can work. We will employ the people from other areas only when there isn’t anyone [to fill in the vacant positions]. We won’t use dynamites for blasting during the trial period. We also won’t use gunpowder or cut down trees. We will use the latest technologies, which are being used in America, when we build the cement factory,” said U Thein Tun, director of Phyu Min Tun Company Limited. Phyu Min Tun Company Limited conducted mineral exploration and feasibility study and implementation of the cement factory at the Min Lwin Mountain since 2014. The company is still trying to carry out the project.